While in retreat, one turns briefly away from the world toward a quieter place where there is opportunity to re-connect with oneself, with community, with the sacred, and with the earth. 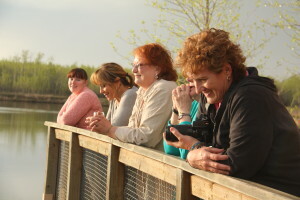 Retreats offer some of the most powerful connection work because they offer space, time, and intentional focus – rare commodities in our overly busy, overly scheduled lives. The ancient Greeks had two words for time. The first was chronos, which we still use in words like chronological and anachronism. It refers to clock time – time that can be measured – seconds, minutes, hours, years.  Where chronos is quantitative, kairos is qualitative. It measures moments, not seconds. Further, it refers to the right moment, the opportune moment. The perfect moment. The world takes a breath, and in the pause before it exhales, fates can be changed. Retreats offer us kairos time – opportune moments of deep breathing and exhaling, away from our chronos-driven lives. When I host retreats – whether I’ve been hired to do so or have created the retreat on my own or with a partner – I am intentional about inviting people into kairos time. We spend lots of time in community, connecting over shared stories, heartaches, joys and longings, and then we take time to step away into our own stillness where we can connect with the whispers that can’t be heard above the din of chronos time. The circle is an integral part of every retreat I host. The Circle Way is the best way I know of to invite intentional listening and deeper connection. Sometimes we gather as a large group, and often we break into smaller, more intimate conversation circles. The circle often shows up in other ways as well. 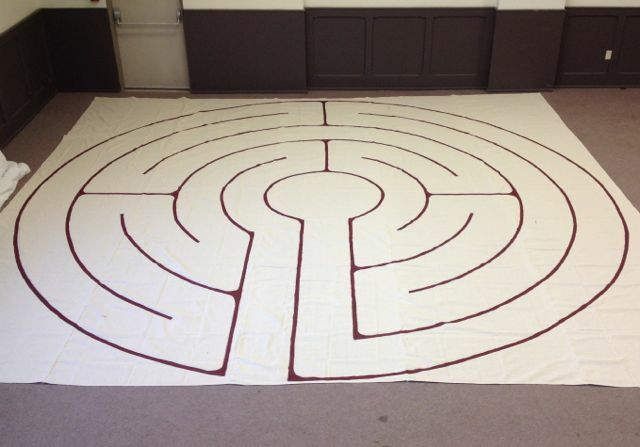 Often I create a temporary labyrinth (with ropes, mowed grass, dried leaves, etc. ), bring a portable one (see photo on the side), or use what’s available to us. 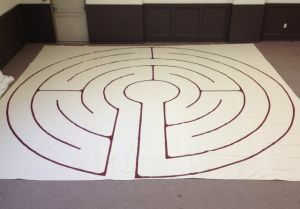 The labyrinth is a powerful tool for integrating the learning that’s been happening, seeking the stillness into which the soul can whisper, and understanding the winding journey of our lives. I also use mandalas in many of my retreats, as a creative journaling tool that helps peal away the layers to the deeper truths underneath, as a community building exercise, or as a tool for strategic planning. I’ve hosted retreats for artists’ guilds, church groups, non-profit and government staff teams, yoga teachers, and international women’s organizations. I would be happy to to talk to you about how a retreat might be designed to fit the needs of your community or staff team. Contact me, and we’ll arrange to meet over phone, Skype, or in-person. Click here for a list of retreats, workshops, and keynote addresses I offer. I’d be happy to talk about how we might adapt one of them to meet the needs of your organization, community, or church. Send me an email or book an exploratory conversation on my online calendar for a Skype or phone chat. Add your name to my email list to stay informed of future offerings and to receive a free ebook, A Path to Connection. Interested in the other work I do? Check out my facilitation, coaching, and speaking pages.